NOLA’s passion is beer. They make good beer for the sake of good beer, inspired by the city they live in with a primary goal of making beer that lives up to its standards. After Hurricane Katrina, no beer was being brewed in New Orleans. Dixie had shut down it’s brewery and was brewed by an out of state brewery. Kirk Coco wasn’t happy his favorite beer said “Brewed in Wisconsin” on the can. Two years later, NOLA beer flowed in the city. Brewed with love. Brewed in New Orleans. * Dryades – Dryades is a sour brown ale aged for over 12 months in oak barrels with plums and cherries. This sour finishes with a hint of chocolate while also sour and dry, with an ABV of 5.5%. Featured on the label is Big Chief Monk Boudreaux of the Golden Eagles to represent Dryades Street and its historic location as headquarters for New Orleans Mardi Gras Indians. 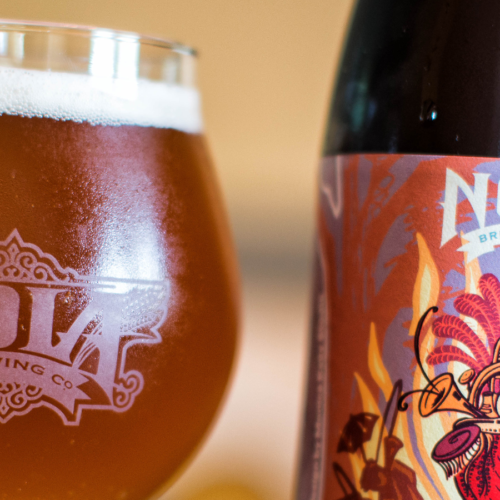 * Maiden Voyage – This 5.9% ABV wild is the breakout wild ale from NOLA’s new Foudre. This Foudre-Aged Saison rested for nine months and came out funky and ready for adventure.